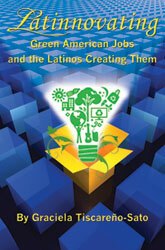 In recognition of Earth Day 2012, I am proud to present a review of the book Latinnovating: Green American Jobs and the Latinos Creating Them. Latinnovating, by author Graciela Tiscareño-Sato, explores the lives, ambitions, and influences of ten Latino business owners who have dedicated their entrepreneurialism to maintaining green business ventures. Latinnovating is essentially a series of well-developed case studies of the ten entrepreneurs and uses their stories as inspiration for students and professionals alike. Published last year, Latinnovating has already earned many accolades and propelled Tiscareño-Sato as one of the top Latina sustainability leaders. Latinnovating is Tiscareño-Sato’s answer to these questions. A former fashion model from Puerto Rico whose experience in the clothing industry influenced her to begin a waste-free printing service. The grandson of a small Texas town migrant worker who put his humble beginnings to work in forming one of the lead companies in sustainable packaging solutions. A daughter of Cuban immigrants who was profoundly influenced by Al Gore’s An Inconvenient Truth to start a consultancy that assists homeowners with “Green Home Makeovers”. A native of East Los Angeles whose modest upbringing motivated him to invest in solar energy for local school systems. One common thread I found through most of the Latino entrepreneurs featured in Latinnovating was how their life experiences affect their views on sustainability. For many, being green is not a business trend, but a strongly held and deeply ingrained value. Last year, I wrote a blog post about how I felt Latinos are “ready made” as green entrepreneurs. As an example, I used my wife’s experiences growing up in Puerto Rico and her recollections of how her family would use rainwater to irrigate crops that would eventually sustain both their business and food. For many families, this sustainable way of doing things has been in place long before North American companies began to capitalize on manufacturing rain barrels and investing in other green initiatives. What Latinnovating has done is capture these ideals and values and formulated them into actionable career paths and methods for innovative leadership skills. I appreciate Tiscareño-Sato’s achievement by recognizing green Latino leaders, their accomplishments, and the ability to relate their cultural values to current business and social initiatives. Although Latinnovating is a well-documented and researched effort, I believe Latino sustainability in business and leadership is a story far from being finished. I will be curious to see what Tiscareño-Sato has in store for the future. Hopefully she will continue to influence and inspire the next generation of innovators. Like the entrepreneurs featured in Latinnovating, I wonder who will be the future leaders and roles models of tomorrow and how their experiences will influence their paths in both work and life? Wow! Felicidades Graciela! Can’t wait to see the movie.